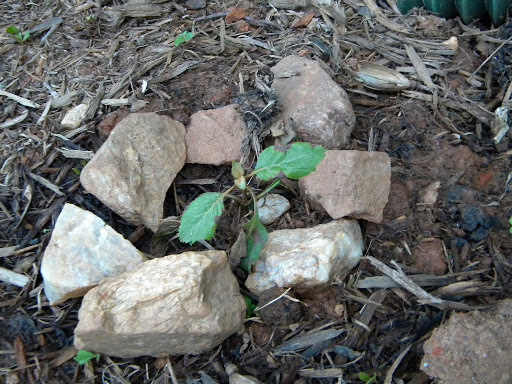 Once upon a time, in a land far away, Pat planted an oakleaf hydrangea. Everytime we pass by the old house when we are visiting friends there, he sighs. He talks about how he’d like to get another one. So, in swapping some plants with a friend, I noticed he had an oakleaf hydrangea. And it had a tiny offspring next to it. So, I grabbed it. It had the tinest root, but it was a root. I brought it home and stuck it in the ground. It didn’t do much, but it didn’t die either. Pat looked at it rather skeptically, telling me they are hard to get established when they are that small. I have been watering it every day and when Pat emptied the compost bin the other night, I took some and dumped it on the hydrangea. It has noticeably perked up since. It’s still small, I am not declaring victory yet, but, I haven’t killed it yet either. When it sprouts new growth, I’ll let you know. And then there is the rose bush. It was a gift when we bought the house. We have alot of shade and what sun we do get, I prefer to use for things like tomatoes. (Priorities you know.) I’ve moved it over the years, hoping this spot will be sunnier than the last,but then trees grew and turned out that spot wasn’t sunnier. I noticed that since losing some limbs this winter, a spot in the front bed that might work. 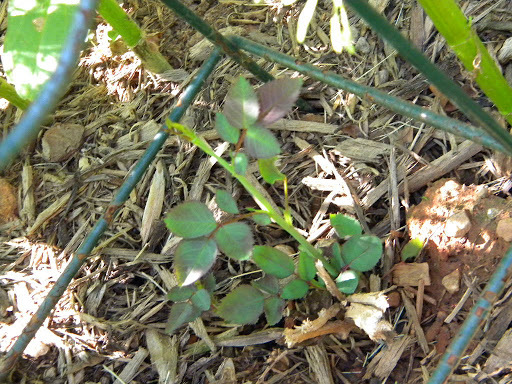 I ripped out the entire bed (it was covered in looseneck goosestrife) and in the process, moved the rose bush again. I cut it back hard and replanted it. It did nothing. I watered it every day, nothing. A month passed, nothing. I gave up and started ignoring it. Then, when I was out checking on the nearby hydrangea, I noticed the tinest new leaf on the stubs sticking out of the ground. Each day, it’s gotten a little bit bigger. This one I will declare victory over. I didn’t kill my rosebush after all. Of course, the zinnias and cosmos I planted nearby are now taking alot of it’s sun. Maybe that’s why it came back – it got used to shade. I think that’s what I like the most about gardening. It’s all a giant experiment.